Tony Award winning actress Chita Rivera is considered one of the foremost accomplished performers in Broadway history. In a career spanning over seven decades, Rivera has starred in some of the most groundbreaking musicals of our time, originating roles in 'West Side Story', 'Bye Bye Birdie', 'Chicago' 'Kiss Of The Spiderwoman' and many others. 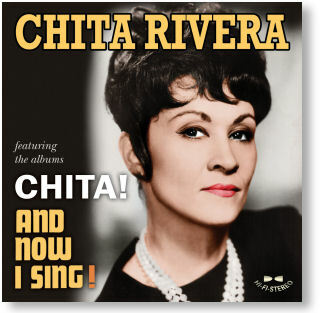 We are pleased to present Chita Rivera's debut solo albums 'Chita!' (1962) and 'And Now I Sing!' (1963). Presented in stereo sound, these remastered recordings make their debut on CD. Both albums present an eclectic mix of showtunes and standards alongside more obscure material handpicked for the sessions. 'Chita!' was recorded in London in October 1961 when Rivera was wowing audiences in the West End production of 'Bye Bye Birdie'. The album features lavish orchestrations by renowned arranger Alyn Ainsworth while 'And Now I Sing!' was recorded in New York with Latin producer and arranger Joe Cain. These early 1960s albums clearly demonstrate that Chita Rivera was as versatile a performer in the recording studio as on the Broadway and London stage.